As the Oberammergau church bells toll, echoing through the dark night, light snow floats down, as I type this report. The Germans have followed the Italians and pulled a rabbit out of a hat (created a miracle). Apparently a week ago cows were grazing in the green paddocks of the Ettal race course, but this weekend the König Ludwig Lauf was successfully held. The 50km course was shortened to two 23km loops but all the skiers were extremely grateful to have an event. 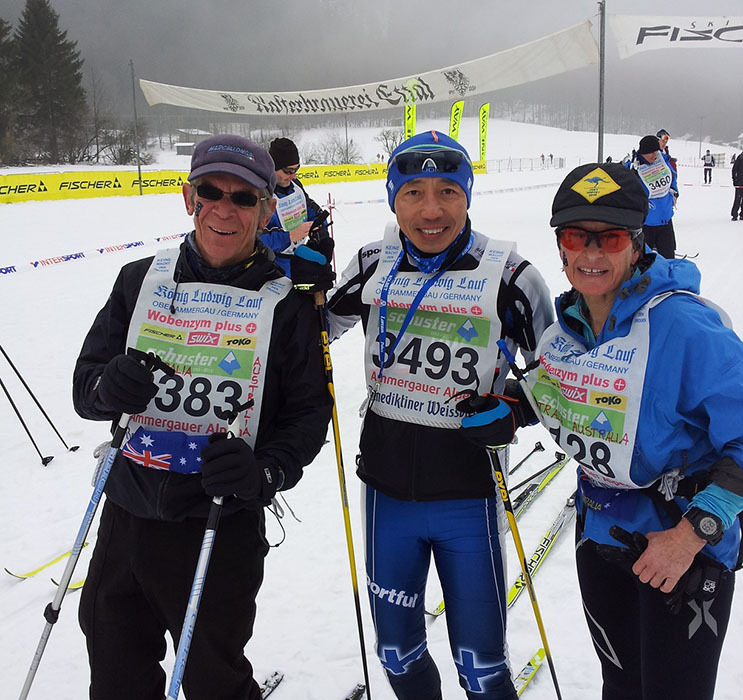 On Worldloppet standards it was an easy mostly flat 23km loop with a few easy gradual ups & downs, making for fast times. The weather on Saturday was a picture perfect day; blue skies, sunny and warm. The short course of 23km started at 9am with the full 46km course commencing one hour later. This provided a clear run for the short course participants, but the poorly distributed time delay of the longer race was a challenge for those participants expecting the earlier start, fortunately the wait was in warm weather. Any change in start time & organisation of race should be communicated via printed information in the bib bag as it is an inconvenience for those who don’t speak German and don’t have internet connections. Unfortunately, there were no classic tracks set for Saturday’s freestyle race. 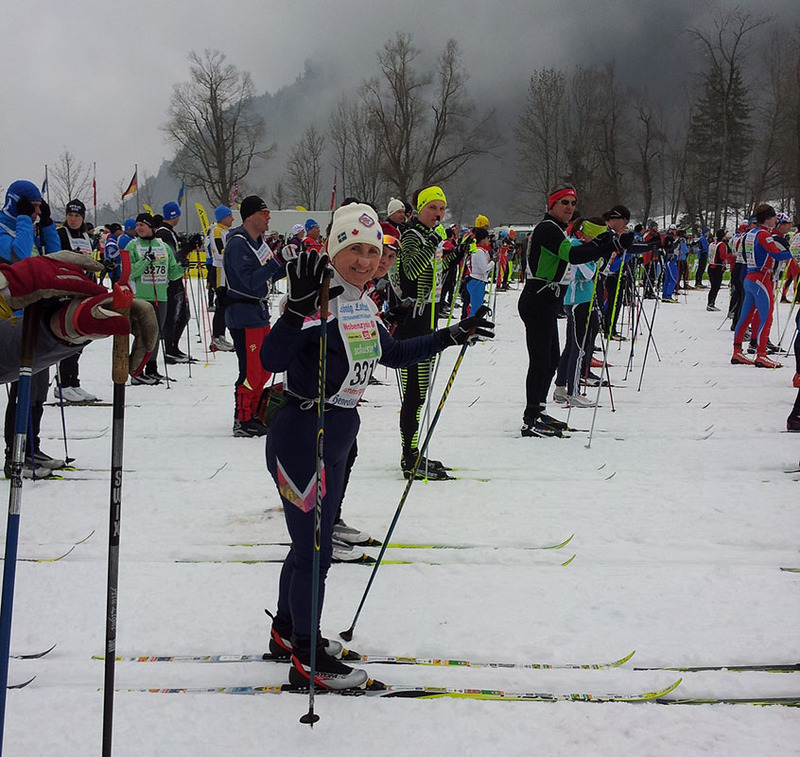 This provided a challenge for classic skiers in both long and short races, as well as an impediment to skaters who wish to use classic tracks for double poling. There are quite a few Worldloppet skiers who like to participate in double races and choose to classic the freestyle events which should be encouraged by having classic tracks set in all races. On Saturday the spectators enjoyed warm sunshine on the sunny parts of the course but in those shadows, brrr. A little snow fell overnight on Saturday and during the 46km classic event. It was magical to watch the new snow fall especially amongst the S’s of the Graswang paddocks which would have made a great aerial photo. Saturday’s snow surface had some minor variations but was considered to be running medium fast with a strong base with a soft top, perfect for a quick safe time. On Sunday the newly falling snow provided a challenge for classic skiers to select the right wax whereas those on fish scales skied on regardless. It was superb to have at least 3 classic tracks in most parts of the course with re-grooming occurring before the start of the 1pm 23km classic race. Bus transport from Oberammergau to the start area was frequent and the return to the Sports Centre for bag pick-up was excellent. Food stations were sufficient with a variety of food and drinks and well-staffed. On the final lap just before the finish the food station attendants made an arch for skiers to ski through and cheered us on to the finish. An abundance and selection of foods and drinks (pasta, sandwiches, cola, fruit drinks, beer etc.) provided a delightful finish celebration at the Oberammergau Sports Centre. Well done to the many organisers of the König Ludwig Lauf, you did a great job! Hayes (Australia) 3:51 ; R. Palliser 3:16 and G Mac Leod 4:15 (Canada) ; Iwana Kralowa and Joseph Kral (Cz) 4:51 ; B. Petroff 3:02 ; H.Larsson 4:44; J. Broussou 4:47 ; A. Viry 4:56 ; J. Luce 5:24 (France)M. Franzolin (Ita) 5:01 ; Y. Maniora (Lux) 3:05 ; S. Petrov 2 :50 ; V. Borissov 4 :39 (Russia) ; J. Wiener (USA) 4 :19. Hayes (Australia) 2:55 ; R. Palliser 2:44 and G Mac Leod 3:19 (Canada) ; P. Tarvis 2:32 and A. Tarvis 3:01 (Estonia); H. Courtine 2:42 ; J. Poux : 3:16 ; Isabelle and Boris Petroff 3:39 ; H. Larsson 3:46 (France) ; T. Huber (Ger) 2:12 ; M. Franzolin (Ita) 3:09 ; M. Matsuyama (Jap) 3:34 ; S. Kvale (Nor) 2:05 ; K. Zatonski 2: 23 (Pol) : J. Wiener 3:32 ; C. Pepin (USA) 2:16 (USA).